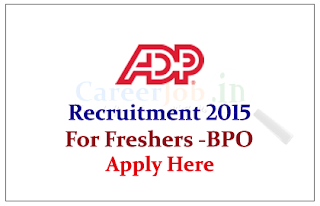 ADP Pvt Ltd is hiring for the post of Process Associate – Non Voice BPO, Location at Hyderabad, Eligible candidate can attend the Walk in Interview on 19th May 2015 and 20th May 2015. ADP Private Ltd. is a 100 % fully owned subsidiary of ADP Inc. (Automatic Data Processing Inc.) and provides Information Technology and I.T. Enabled Services to ADP business divisions worldwide. Established in 1999, ADP Private Ltd. Interested and eligible candidate can attend the walk in interview on 19.05.2015 and 20.05.2015 with current resume.